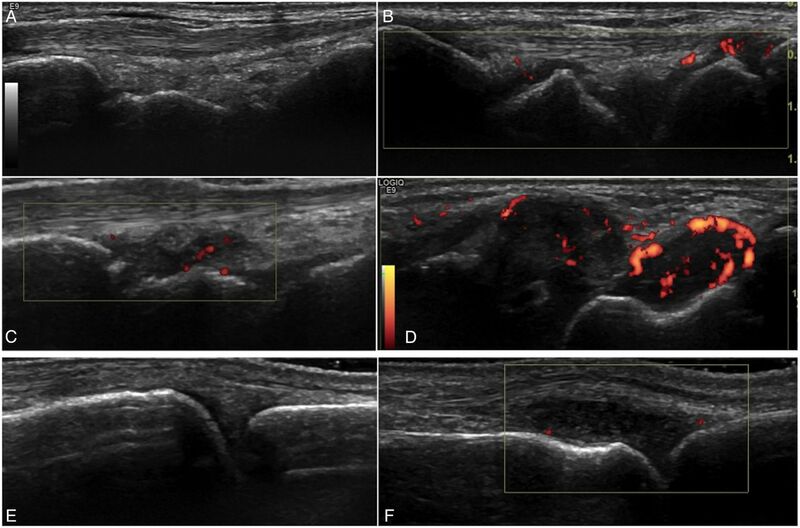 Sonographic features of inflammatory joint synovitis and erosions are more common in Rhupus, followed by Jaccoud's, and less common in the non-deforming-non-erosive category. This higher inflammatory burden in the joint with destructive features correlates with overall SLE disease activity, while tenosynovitis predominates in those with milder disease activity. Ultrasound appears to detect far more joint and tendon abnormalities in Lupus patients than are symptomatic of musculoskeletal pain. But are these findings prognostically and therefore therapeutically relevant? It appears that sonographic abnormalities like joint effusion and synovial hypertrophy, especially in the toe joints, are very common in SLE patients. Most of the patients are asymptomatic. Power doppler positivity, best correlated with inflammation, is detected in only about 1%. These findings do not correlate with SLE disease activity markers. The routine sonographic evaluation of asymptomatic lupus patients should therefore not be recommended. To describe long-term clinical and serological outcome in all systemic lupus erythematosus (SLE) domains in SLE patients with hand arthralgia (HA) and joint ultrasound (JUS) inflammatory abnormalities, and to compare them with asymptomatic SLE patients with normal JUS.